The year 2018 marks the 15th anniversary of China-ASEAN Strategic Partnership, the 15th anniversary of China-ASEAN Expo, and the first China-ASEAN Innovation Year. The event, held on September 13 in Nanning, was jointly sponsored by the State Administration for Market Regulation, China National Intellectual Property Administration (CNIPA) and the People's Government of Guangxi Zhuang Autonomous Region. The theme of the forum is “Trademark, Brand Strategy and Economic Development”. 300 participants, including the heads of relevant government agencies from 9 ASEAN countries, representatives of non-governmental organizations, experts and scholars, relevant national ministries and commissions, heads of industrial and commercial bureaus of some provinces (municipalities, districts, and Municipalities with Independent Planning Status under the National Social and Economic Development) of China, well-known domestic economists and entrepreneurs, etc., officially gathered in the Green City. The China-ASEAN Trademark and Brand Forum is the first international forum under the framework of the China-ASEAN Expo that is ever held in China, and is titled with the words of trademark and brand and oriented to the ASEAN countries. The forum provided a platform for Chinese and ASEAN governments, business community, and academia to discuss the issues of strengthening the cooperation in trademark and brnad protection and creating a good business environment. And it provided a cooperation platform for China and ASEAN companies to enhance understanding, share new opportunities, seek to achieve new developments, and provide mutual benefits and win-win results. Li Bin, vice chairman of the Guangxi Autonomous Region, attended the forum and delivered a speech. 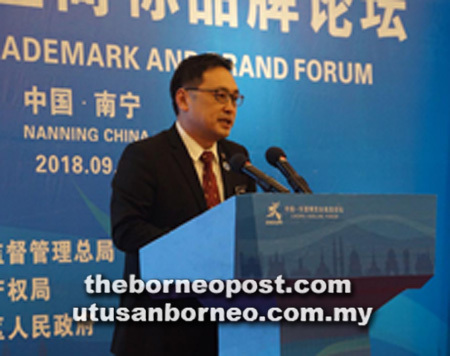 He said that this China-ASEAN Trademark and Brand Forum focused on the theme of "Trademark, Brand Strategy and Economic Development" and aimed to implement the "Common Initiative to Strengthen IP Cooperation in Countries along the Belt and Road", enhance communications on business environment and interconnection between China and ASEAN, explore the mechanisms and paths for trademark registration and protection cooperation between the two sides, jointly promote the growth and increasing influence of China-ASEAN trademark and brand, bring new opportunities for creating a higher level of China-ASEAN strategic partnership, and open up broader opportunities and prospect. 1. Joint China-ASEAN Trademark, Brand Entrepreneurship and Innovation Development Platforms. It should build the China-ASEAN Trademark; Brand Entrepreneurship and Innovation Base into a gathering place for exchanges among China-ASEAN enterprises and collection of elements of enterprise high-end technologies and brand innovations, and an international trademark and brand innovation center in the region with significant influence. 2. Joint China-ASEAN trademark and brand research center to strengthen cooperation in trademark and brand protection in countries and regions along the “Belt and Road”, conduct research on international business environment, and promote dialogue and exchange between China and ASEAN on trademarks and IP rights. 3. Joint training of China-ASEAN trademark and brand talents, and strive to cultivate a large number of specialized talents who understand China-ASEAN national conditions and know business proficiently that will provide a strong support in terms of talent and intellectual security for implementation of the trademark and brand development strategies. Subsequently, Liu Junchen, a Party Member of SAMR, Secretary and Deputy Commissioner of CNIPA, made a keynote speech titled “Strengthening international cooperation in trademark and brand and promoting regional economic win-win development”. Mr. Liu reviewed the history of China's trademark and brand business since the implementation of China's national IP strategy in 2008. In order to strengthen the pragmatic and win-win cooperation between China and ASEAN in the field of trademark and other IP rights protection, Liu proposed 4 points, that is, to enhance the information interoperability and sharing and cooperation mechanism, optimize the law enforcement cooperation mechanism, improve the personnel training cooperation mechanism, and jointly build a more fair and reasonable international rules. Liu said that the Chinese market supervision and management departments and IP departments will carry out pragmatic cooperation in the protection of trademark and brand rights in a broader scope, higher level and wider scope, to jointly create an open, transparent, equal and efficient IP protection environment; jointly explore new modes of IP management in the digital age, better promote the dissemination and application of IP innovation achievements; jointly promote the construction of normalized cooperation mechanisms, create a new progress for regional cooperation in protection of IP rights, promote an upgrading of China-ASEAN regional economic and trade cooperation, and promote regional harmony and common development. Ouk Prachea, State Secretary of the Ministry of Commerce of Cambodia, H.E.Arlina, head of the Indonesian government delegation and director general at the Export Development Directorate of the Ministry of Trade of Indonesia, Su Ludong Sundara, deputy minister of the Ministry of Science and Technology of Laos, and Chong Chieng Jen, deputy minister of the Ministry of Domestic Trade & Consumer Affair Malaysia, Nora Terrado, head of the Philippine government delegation and deputy minister of the Philippine Department of Trade and Industry, delivered a keynote speech centering on the forum theme, expounding their respective views and opinions on trademark and brand strategy and economic development. Win Khaing, Director-general of the Research and Innovation Department of the Ministry of Education of Myanmar, Wanpen NICROVANACHUMRUS, Deputy Director of the IP Department of the Ministry of Commerce of Thailand, Li Yulin, Deputy Director of the State IP Office of Vietnam, and Chen Hongbing, Director of the China Office of the World Intellectual Property Organization, each made a thematic report, introducing the relevant systems, measures and experiences of countries and WIPO for the protection of trademarks and other IP rights and IP innovation applications, so that the participants could better understand the relevant policies, regulations and practices among countries. The guests at home and abroad, by using their own actual practice and research results, made wonderful speeches on how to strengthen the cooperation in protection of trademark and brand rights and jointly create an open, transparent, equal and efficient IP protection environment. Wen Shuwen, Chief IP Examiner of the Hong Kong IP Department, Li Guanbin, Director-general at the Shandong Provincial Administration of Industry and Commerce, Feng Xuejun, Director-general of the Industrial and Commercial Bureau of Guangxi Autonomous Region, Fang Guanghong, Chairman of the Board and President of Guangzhou Wanglaoji Pharmaceutical Co., Ltd., Tao Shiquan, Chairman of the Board and CEO of Chongqing Jiangxiaobai Wine Co., Ltd. , Chen Zhongwei, general manager of Hengyuanxiang (Group) Co., Ltd. and other three representatives of entrepreneurs, as well as Xu Ningning, executive director of China-ASEAN Business Council, and Yu Mingxuan, professor of Renmin University of China, made keynote speeches respectively. Director-general Feng Xuejun of the Industrial and Commercial Bureau of Guangxi Zhuang Autonomous Region said at the forum that as the frontier and window of open cooperation between China and ASEAN, the industrial and commercial departments throughout of the whole region will further promote protection of trademark and brand, promote the open development of trademark and brand, and promote systematic exchange on trademark and brand exchange. And Guangxi will work together with the ASEAN countries to promote construction of the China-ASEAN Trademark; Brand Entrepreneurship and Innovation Platform, China-ASEAN trademark and brand research center and training base, and to build a closer China-ASEAN community with a shared future. Fang Guanghong, chairman of the board and president of Guangzhou Wanglaoji Pharmaceutical Co., Ltd., said that, by taking the advantage of this “China-ASEAN trademark and brand Forum”, his enterprise are willing to make more new friends, carry out broader economic cooperation, and actively explore domestic and foreign markets, create an international national brand and help economic and trade exchanges and socioeconomic development between China and ASEAN countries. Yu Mingxuan, a professor at Renmin University of China, believes that countries should base on their own national conditions to publicize the rankings and values of trademarks and brands that can reflect the competitiveness of trademark and brand in various countries, and diligently safeguard the legitimate rights and interests of independent brands in international market, and cause enterprises to consciously pay attention to their own brands, help consumers cultivate their own brand emotions, and provide effective services for brand building and industrial upgrading. He called for joint attention and efforts to the growth of trademarks and brands, and effective implementation of trademark and brand strategy, to promote human being progress and enjoy beautiful brand products. During the forum, Administration for Industry & Commerce of Guangxi Zhuang Autonomous Region and JD Group signed the "Strategic Cooperation Framework Agreement on Optimizing the Market Environment", to carry out in-depth cooperation on information interconnection, e-commerce service, market risk prevention, and consumer rights protection, and further explore the new energy for the region’s economic transformation, serve the rural revitalization strategy, and inject new impetus into the high-quality development of Guangxi's economy.